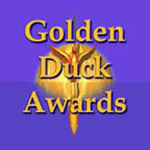 This year’s Golden Duck Awards have been announced. 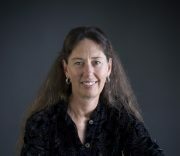 Designed to encourage science fiction literature for children, The Golden Duck Awards are presented every year at Worldcon. Oh No! (Or How My Science Project Destroyed the World) by Mac Barnett, illustrated by Dan Santat. Hyperion. Missle Mouse by Jake Parker. Graphix. The Adventures of Ook and Gluk, Kung-Fu Cavemen from the Future by Dav Pilkey. Blue Sky Press. Binkey to the Rescue by Ashley Spires. Kids Can Press. Zig and Wikki in Something Ate My Homework by Nadja Spiegelman. Toon Books. Alien Encounter by Pamela Service and Mike Gorman. Lerner. Ivy and Bean What’s The Big Idea by Annie Barrows and Sophie Blackall. Chronicle Books. The Samantha Granger Experiment: FUSED by Kari Townsend. Sourcebooks Jabberwocky. Stuck on Earth by David Klass. Farrar, Straus and Giroux (BYR). Kid vs. Squid by Greg van Eekhout. Bloomsbury USA Childrens. WWW.Watch by Robert J. Sawyer. Ace Books. Cassini Code by Dom Tesla. Tor Teen. Virals by Kathy Reichs. Razorbill. Leviathan by Scott Westerfeld. Simon Pulse. Vulture’s Wake by Kirsty Murray. Holiday House. Hey, it was lovely to cruise by here and see my name in the runner-ups. Just a small correction: My last name is missing the van in van Eekhout. A ‘themed’ collection of SF and fantasy stories , most originally published in Analog and F&SF, tackling the always popular subject of human/alien love and accompanying species conflicts.